I was asked last week if I would give the game 0 A.D a try and, after some internal debate, I finally decided to give it a go. My hesitation came from two aspects of the 0 A.D project, the first being that the developers list 0 A.D as being in the Alpha stage of development. In other words, it’s not finished yet, there are features to add and aspects of the game to change. It was entirely possible the game wasn’t stable yet. The other reason I didn’t dive right in is 0 A.D is a real-time strategy game and I haven’t been pleasantly engaged in a real-time strategy game in a long time. In fact DOS was my main operating system the last time I enjoyed a round of RTS play. The whole Warcraft/Starcraft style of game play isn’t something I’ve been interested in. I guess it’s just the way my mind works. If you hand me a role playing game where we follow one hero around, fighting things, mixing items and balancing stats, I’m all for it. Likewise if you set me in front of a turn-based strategy game such as Civilization then I’m happy for days. But there’s something about mixing the two, controlling large numbers of characters in real-time which just doesn’t work for me. Or rather, I don’t work for it. Perhaps I’m just bad at multitasking quickly. What finally made me give 0 A.D a shot is the project’s website. The project includes a great deal of documentation, screen shots and a well written user’s manual. A lot of effort has been put into documenting 0 A.D and I thought if the developers would go to this much effort to explain the game, they probably put a good deal of effort into creating it too. At any rate, I resolved to throw myself back into a genre I’ve largely let pass me by for the past decade and a half. Let’s take an overview of 0 A.D. The game supposedly takes place between 500 BC and 500 AD, as one might guess from the title. It attempts to be more or less historically accurate in portraying six different civilizations, mostly those living around the Mediterranean Sea at the time. Each civilization has different units, strength and weaknesses, which makes for more varied game play. Players are required to find and gather resources, build up a military, create civil infrastructure and construct defences. The other players (all AI controlled in my case) would be doing the same and, of course, each player hopes to eventually be the last one standing. 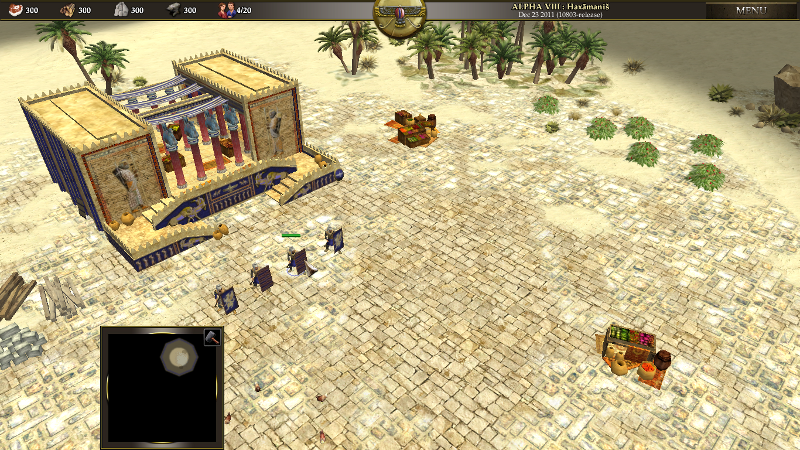 The game is available for Linux and Windows and, though no package is provided for OS X users, there are instructions on the game’s website for compiling 0 A.D from source code on OS X. The download for 0 A.D was about 250MB and, when unpacked, it took up nearly 1GB of disk space. The game requirements are fairly low, just about any video card will do and the RTS is fairly light on memory, using around 300-400MB in the smaller scenarios. Since I mentioned scenarios, let’s talk about game play a bit. 0 A.D strikes me as being a sort of cross between SimCity and Civilization. We start off with a single key building which houses food and builds new civil and military units. We also typically begin with a few military units which can scout, gather resources and construct new buildings. Clicking on a unit or dragging the mouse across multiple units will select them. We can then right-click on other things (trees, rocks, animals) to have the units go forth and gather those items as resources. Clicking on units also brings up menus letting us further control how the unit behaves and, for most units, it also shows a list of items the unit can build. It look me a little while to get used to the various icons and what they represented, but I’d say the interface is pretty intuitive. We can move around the map using the arrow keys and zoom in or out of the action using the mouse wheel (or short-cut keys). I found the controls were pretty straight forward and, after about five minutes or so I had all my little units busily building or gathering. Shortly after I found clicking on my main building would allow me to build new worker/solider units and I was all set. Around this time I was congratulating myself on figuring out the basics of the game. Then my opposition arrived en mass and laid to waste my units and my buildings. If you’d like to skip my trial and error approach to RTS gaming, you can read the 0 A.D User Manual which explains things quite well. I probably should have started there, but everyone knows how we men feel about reading the instructions. My second attempt at playing went a bit better. Having the basic controls under my belt and now knowing what all the icons represented, I was able to get a small settlement going with plenty of resources coming in, buildings being erected and soldiers patrolling the parameter. However, once again, eventually the AI soldiers appeared and, after a few waves of them, they managed to finish me. At this point I’d like to bring up one of my few complaints about the game: so far I haven’t found a way to tell my main building to keep pumping out a given type of unit. I keep getting side tracked following my soldiers around, ordering new things created and I keep forgetting to go back to the central building to order a new batch of units to be created. This causes me to lag behind in military numbers and falling behind in the size of one’s army isn’t something one should do in 0 A.D. If I find a way to lock in construction of a given unit or a way to remind myself to keep going back without breaking my flow I suspect I’ll master this game. By the time his response came back I’d played a third game and I’m starting to feel like I’ve got a handle on things. Oh, I’m still losing, but I’m having fun and learning how to balance civil and military jobs. The game feels pretty fast-paced, at least on the smaller maps, and I was happy to find the starting location is generally near a good deal of resources, making it easy to get the basic infrastructure in place. Though I haven’t mentioned them before, I’m finding the graphics to be of very good quality, especially considering how light the game is on resources, just about any video card should be able to render this game. Yet the trees look real, the water is beautiful and the detail in the human animations is of professional quality. Even though it’s still in early development and despite the fact it’s completely free to download and play, 0 A.D is really well put together. It’s polished, it’s stable and, even for this non-RTS guy, it’s a good deal of fun. I plan to keep playing after this review is over. Should you try 0 A.D and find you enjoy it, as I have, then you can donate to the project to help keep development going. They have a donation button at the bottom of this page. Thanks for the review. It’s good to hear OAD is making progress – “polished” sounds encouraging and the game has always had promise, given that its genre has been a favorite for years. It would have been interesting to hear if there has been progress with local lan game play as it was basically non-functional when I last tried a year or so ago. AI can be fun, but so can playing these games with/against a friend, networked locally in that almost retro sort of way that is getting rare now. Open source games can be particularly suited to this.